Other than Sunday at Animal Kingdom our predictions this week proved to be accurate. We correctly predicted the upshoot in wait times arriving Friday and Saturday. Crowds are greatly affected by weather this time of year either with warm temperatures bringing out local guests to the parks or with winter storms delaying the arrival of guests that fly in from feeder cities in the north, east, and central U.S. We’ll see what effect if any, the recent weather may have on vacationers traveling during the week of Presidents’ Day. 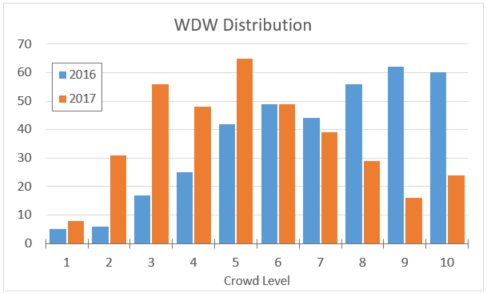 For now, let’s look at how the crowd levels stacked up day-to-day last week. Sunday’s wait times at Animal Kingdom’s Dinosaur and Kilimanjaro Safaris were so high that they skewed the resort-wide crowd level to a ‘6’. In reality, the rest of the resort was much closer to the level ‘3’ we predicted. It is not clear why these two attractions hit their maximum average wait time (36 minutes at DINOSAUR, 64 minutes at Kilimanjaro Safaris) while all other attractions stayed near the middle of the scale, most notably Expedition Everest with an average posted time of 44 minutes. Under-predictions at Animal Kingdom continued on Monday with attraction wait times exceeding our predictions by two to five levels. Again, our predictions for Expedition Everest were accurate but Dinosaur far exceeded what we expected. Resort-wide wait times were about average, at a level ‘4’, one level higher than our prediction of ‘3’. Other than Animal Kingdom, Magic Kingdom was the only park to reach as high as a ‘5’ on Monday. All predictions on Tuesday proved accurate within one index level. Resort-wide we saw the lowest crowds of the week at a level ‘2’. The Studios had the lowest crowd as predicted with all attractions averaging their lowest posted times of the year. Toy Story Mania averaged a posted time of 49 minutes and Expedition Everest averaged only 11 minutes. Predictions hit the mark again on Wednesday although two parks, Magic Kingdom and The Studios ended up over-predicted by two. A great day to visit any park, none reached a level above ‘3’. The largest crowd was at Animal Kingdom which hosted Extra Magic Hour morning and reached a level ‘3’. Thursday’s crowds stayed at ‘5’ or below as predicted, continuing the lull before the Valentine’s Day and Presidents’ Day crowds arrive. Magic Kingdom’s Extra Magic Hour morning brought in a crowd level ‘5’ as expected with Space Mountain averaging a 43-minute posted time. The Studios had the lowest crowds, a level ‘3’, with Star Tours averaging a posted time of 15 minutes and The Great Movie Ride averaging 14 minutes. Thursday was the last day of below average crowds before the weekend. Valentine’s Day brought a level ‘8’ at Magic Kingdom, two higher than the ‘6’ we predicted. Surprisingly, it was Pirates of the Caribbean and Haunted Mansion that had the highest relative wait times at 37 and 39 minutes respectively. Every year crowds on February 14th are less related to the celebration of Valentine’s Day than to its proximity to Presidents’ Day. When these two holidays coincide with Mardi Gras as well, expect crowds a lot higher the the resort-wide ‘6’ this year. Six was the number on Saturday as well, as predicted. 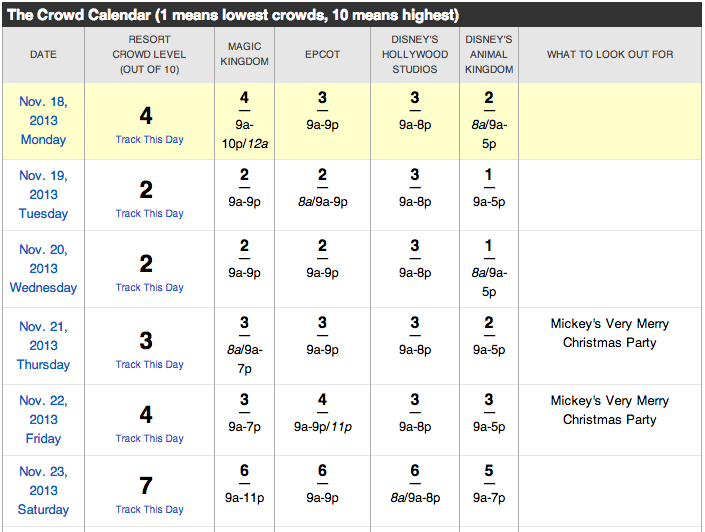 Only Animal Kingdom was more crowded than a ‘6’ but it reached only one level higher, a ‘7’. At every other park and resort-wide, ‘6’ was the number. Accurately predicting a level ‘6’ at Magic Kingdom on Saturday was impressive given that the park had extended hours from 8:00am to 1:00am, a schedule normally reserved for the busiest of days. Mid-February marks an important transition in the Walt Disney World Crowd Calendar. Presidents’ Week crowds start to fade by Friday, but the resort then hosts the Princess Half Marathon. This then leads into Mardi Gras and eventually the busy Spring Break season. We were at animal kingdom Sunday morning and switched out because the cheerleaders at disney for the international competition were everywhere. It was more crowded walking around than it was thanksgiving week! Magic kingdom really emptied out by 5 that night though so the evening at least was more productive in terms of rides! I was there at the same time and HOLY CHEERLEADERS! They really were everywhere en masse. We stayed at Pop Century and ended up taking a different bus from HS on Tuesday as the line was two queues back full of cheerleaders. It was nuts. I don’t remember seeing anything about this competition when I was planning this trip! I COMPLETELY agree with this. 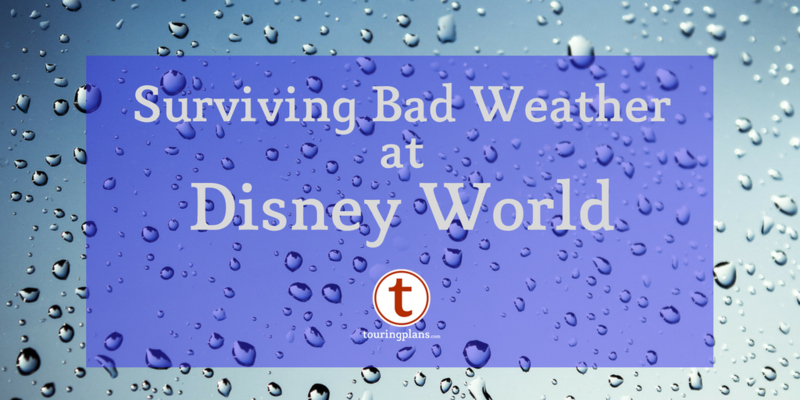 I never saw any plans for this when I made my plans to do to WDW during this time. But there were SO many, there is no way this cheerleading competition wasn’t planned quite a bit in advance. And I heard some groups came from other countries. They even impacted the parks in ways not expected. I had assumed all the events would be at the sports complex; but apparently some were taking place at the parks. Too bad for you if you wanted to see the Indiana Jones show! We were at Epcot on Sunday, Feb 9 and we noticed hordes of cheerleaders too. The funniest thing is that whenever they were standing around, they’d all be on their smartphones – do people not talk/interact with each other anymore? We were at Pop too! We almost couldn’t get on magical express to leave Tuesday as they were all over the place trying to get to the airport! You’re not kidding…Cheerleaders abound! We also encountered large tourgroups of Brazillian teens at Animal Kingdom on Monday. Incidentally on that Sunday we were 15 min late for the 8am rope drop in AK. But proceeded to ride Everest 3 times in a row, primeval whirl twice (sat on the ride as the loader said just go again) dinosaur, kali twice and Kilimanjaro safaris by 11am then walks both trails and left as seas of people flooded in. I’ll call that one a win! MK was nuts on valentines day!